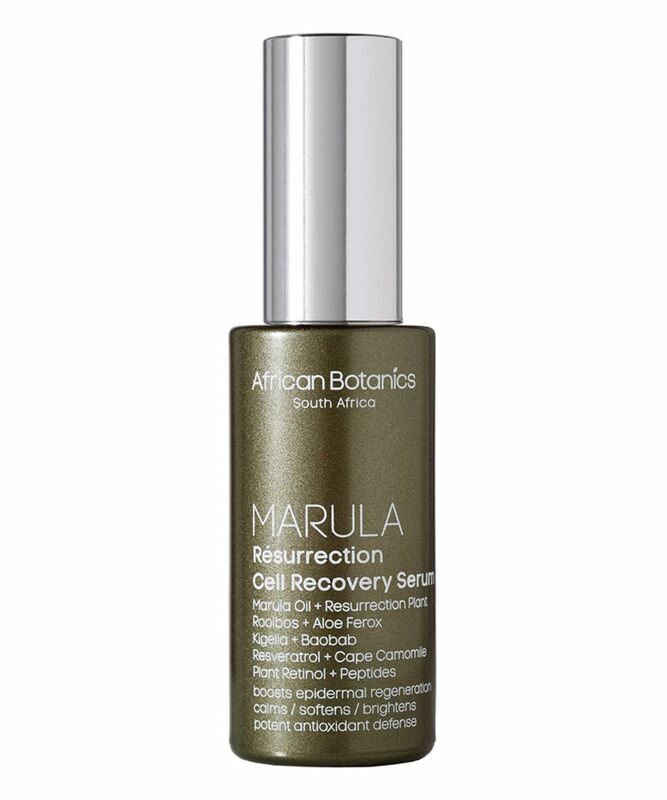 With a supercharged blend of youth-boosting actives, African Botanics’ night-time ‘Resurrection’ serum works to correct the tell-tale signs of cellular slow down – dramatically diminishing effects of sun damage, ageing and the ravages wrought by everyday exposure to pollutants. Extracts of resurrection plant and green sea algae work alongside hyaluronic acid to attract water and prevent moisture loss which in turn, ‘swells’ cells to exhibit a plumping and line-lessening effect. Swiss garden cress lipopsomes – a rich source of sulforaphane (a powerful antioxidant) – then works to inhibit the synthesis of melanin which provides exceptional brightening benefits; diminishing existing dark spots to restore uniformity of tone. Use in the evening only. Apply 2-3 pumps. Massage onto cleansed damp skin: face, neck, and décolleté before applying an oil and/or hydrating cream if desired. Tap a small amount around the eye area. Aqua (Water), Hamamelis Virginia (Witch Hazel) Distillate Oil, Vegetable Glycerin, Arnica Cordifolia Extract, Aloe Ferox (Bitter Aloe) Leaf Extract*, Cucumis Sativus (Cucumber) Extract, Myrothamnus Flabellifolius (Resurrection) Plant Extract, Sambucus Nigra (Elder) Flower Extract, Malva Sylvestris (Mallow) Extract, Hedera Helix (Ivy) Extract, Anacyclus Pyrethrum (Pellitory) Extract, Panthenol, Hydrolyzed Wheat Protein, Sodium Hyaluronate (Hyaluronic Acid), Phytic Acid, Sclerocarya Birrea (Marula)* Seed Oil, Adansonia Digitata (Baobab)* Seed Oil, Linoleic Acid, Kigelia Africana Fruit Extract*, Sorbitol, Tocopherol (Vitamin E), Ascorbyl Methylsilanol Pectinate, Urtica Dioica (Nettle) Extract, Equisetum Arvense (Horsetail) Extract, Hydrocotyl (Centella Asiatica) Gotu Kola Extract, Chamomile Martricaria Extract*, Chlorella Vulgaris (Green Algae) Extract, Lepidium Sativum Sprout (Swiss Garden Cress) Extract, Lecithin, Aspalathus Linearis (Rooibos Tea) Extract, Pichia/Resveratrol Ferment Extract, Retinyl Palmitate, Palmitoyl Tripeptide-5, Citrus Aurantium (Neroli) Essential Oil, Eriocephalus Punctulatus (Cape Chamomile)* Essential Oil, Rosmarinus Officinalis (Rosemary)* Leaf Essential Oil. *Organic and wild-harvested ingredients. For such price - not impressed with the results. 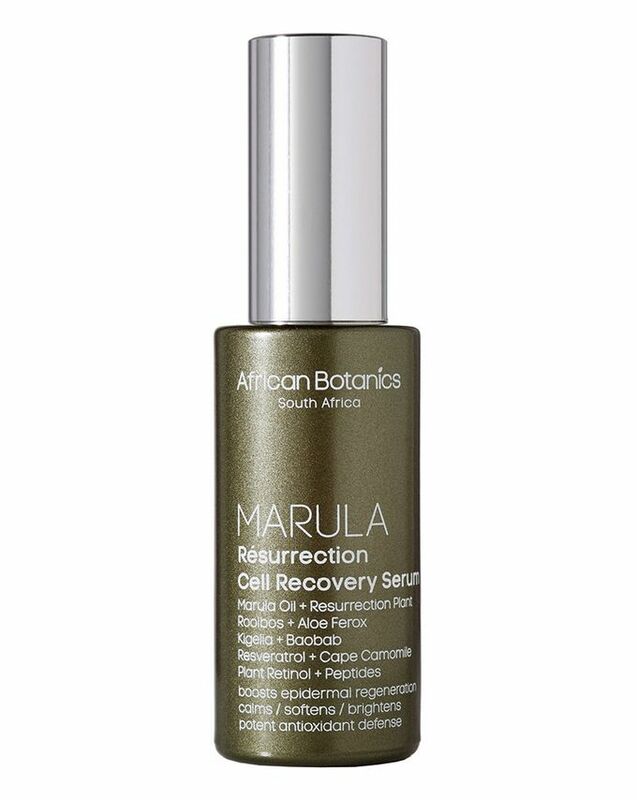 I love the story behind the Resurrection Plant, from which this serum gets its name. This plant basically spends a lot of its life looking like a completely dried up dead ball of twigs in the African desert. Within an hour of the rains arriving it unravels from it's ball of deadness and within hours it's unrecognisable as a thriving plant. Google it! By exploiting these extraordinary plant properties, alongside the wonders of hyaluronic acid, African Botanics have created a serum with the ability to bring your dull, dry skin back to life in a similar way. I would highly recommend this for older, dry skin types as within an hour of applying you can really feel this action happening on the surface of your skin. NB I would also recommend it for many adult acne sufferers because a lot of the time this is caused by dry skin cracking and bacteria getting into the fissures. It's a 100% natural, clear, light gel which sits well under moisturiser and helps your make up maintain its integrity all day without the usual flaking one gets around 4pm with dry skin. African Botanics has become my favourite skin care brand. It never fails to deliver results. Now on my second bottle of this & it will now be a staple in my skin care regime. Used at night time under their intense repair balm or oil, I wake up to plump, bright & hydrated skin. Love it.